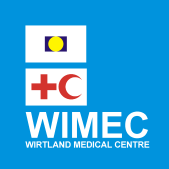 Wirtland Medical Centre (WIMEC) is a new project which aims to offer versatile medical consultation services over the internet. The WIMEC's services will be available to everyone through Skype. Doctors give professional consultations to patients worldwide, earning consultancy fees which they choose themselves. If you are a certified doctor, and you want to offer your services for WIMEC, click here. WIMEC is not a commercial project. Wirtland will not charge doctors any fee for listing at WIMEC. Bulgaria may become the world's first nation to officially recognize Wirtland. On December 22th Bulgarian daily newspaper "Telegraph" quoted Mr. Dragovest Goranov, Spokesman of Foreign Ministry of Bulgaria, who discussed the possibility of recognition of Wirtland with correspondent. "More than 180 people have joined Wirtland already, about half of them being our compatriots", - Bulgarian newspaper points out. Official recognition of internet-based worlds is becoming less unusual now, after Sweden was followed by other nations in recognizing Second Life in 2007. The interest of Bulgarians to Wirtland started after a television show at Bulgarian Nova Television. "Telegraph" dedicated a full page's article to Wirtland on December 6th. The Bulgarian daily also showed interest in supporting the Miss Wirtland Photo Contest, which started recently. This comes naturally as majority of the beauty contest's participants are from Bulgaria. Bulgarian language is becoming increasingly popular in Wirtland. Some of the citizens' forums are now bi-lingual, as, for instance the recently-started "Cooking Book". Participants share the recipes of favourite dishes, and are working to create Wirtland's national food. Other popular ethnic group in the first web-based country is Argentinean, which also organized several meeting points. Importantly, the ethnic groups are not isolated. They actively interact between each other, overriding the language barriers with ease. A new intercultural dialogue project is underway thanks to witizens from the USA. Wirtland Citizenship Application forms are already available in English, Spanish, Bulgarian, and Portuguese. Chinese and Russian forms will be released soon. Wirtland warmly greets the interest from Bulgarian people and government, and hopes for building mutually beneficial relations with Sofia. To celebrate the holiday season Wirtland started to collect entry photos for "MISS WIRTLAND" Beauty Contest. If you are a lady Witizen and want to participate in Miss Wirtland, you may submit your photograph(s) to the Contest - click here. If you have not yet signed up at Witizens Network, the admission procedure is free and simple. Please rename the photos which you want to submit for competition, adding MISS to the title of photo. For instance, if you have "picture_1", it must become "MISS_picture_1". Don't be shy, let's have some fun! If you want to rate photos, come visit the album anytime. Thank you for rating and participating. The first big newspaper article about Wirtland has recently been published. The article by Milko Levitcharov appeared in Bulgarian daily "Telegraph" on December 6, 2008. We have recently received the scan of the article from one of Witizens. Bulgaria became the first country to cover Wirtland both in printed media and on national television. This coverage led to large-scale influx of new citizens from Bulgaria. Bulgarian became the third language, in which the Witizenship Application Form is available (after English and Spanish). Click on the image to view the article (if you read Bulgarian). The article is illustrated with the Wirtland Residence Permit, Wirtland's postage stamp, and other images. We hope the author or someone of Bulgarian Witizens will translate the article to English, or make a short summary, to make the article available for a broader audience. Wirtland's first press release entitled "Wirtland offers citizenship, declares sovereignty with no territorial claims", distributed on November 22, is now featured in Google News. Recently the Press Section was added to the Wirtland's website. In the Press Section the journalists and other media representatives are now able to view and download the latest press materials, including Wirtland's press releases in PDF format, and high-resolution images. The Press Section will also monitor the international coverage and re-post selected articles. A new section "Legal Aspects" with questions and answers about legitimacy of Wirtland has been recently added to Wirtland's website. You can also read the text below. http://witizens.ning.com/forum/topics/legal-aspects-of-wirtland. Questions & opinions are welcome. Why Wirtland considers itself sovereign? According to the above-mentioned Montevideo Convention on the Rights and Duties of States, to have sovereignty, a state must have a permanent population, a defined territory, a government, and it must have the capacity to enter into diplomatic relations (Article 1). Wirtland meets three out of four of these criteria. It has permanent citizens, who receive passports and may register any legal act with the Wirtland’s authority. Wirtland has government and may engage into relations with other entities. The only basic difference between Wirtland and a traditional state is absence of a defined territory. However, many of so-called self-proclaimed states, which meet all four of the Montevideo Convention’s conditions, still are not considered sovereign subjects of international law. This makes the Montevideo Convention’s requirements questionable, and strengthens the position of such states and their right of sovereignty. The fast development of global communication and especially Internet leads to considerable changes in the present understanding of sovereignty. The today’s international lawyers specifically emphasize this tendency, doubting the Montevideo Convention’s set of criteria. In his paper “The Acquisition of Sovereignty by Quasi-States” professor Noel Cox points out: “Yet, this [Montevideo Convention’s] definition is increasingly meaningless. The notions of sovereignty and statehood are not easily defined or explained…. With the growth in both the (horizontal) extent and (vertical) reach of international agreements, treaties, conventions and codes, national independence is becoming less relevant. This tendency is becoming more noticeable in the modern commercial environment, and especially the internet”. Absence of its own land: an advantage? 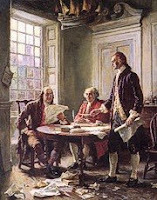 As the traditional self-proclaimed state typically forms by way of separation from another state, the territorial question is always the main source of dispute. Wirtland’s sovereignty is not based on any kind of separatism. It does not claim any land, which belongs to other entity, therefore there is no intrinsic conflict in the Wirtland’s concept of sovereignty. Therefore, we see absence of own land rather as an advantage. It allows for unclouded relations between Wirtland and other nations of the world. Are there any similar cases, precedents in international law? The political existence of Wirtland is completely legal. Though political existence of Wirtland does not depend on recognition of other states, it welcomes all the efforts towards building peaceful relations with all the world’s states and international organizations. 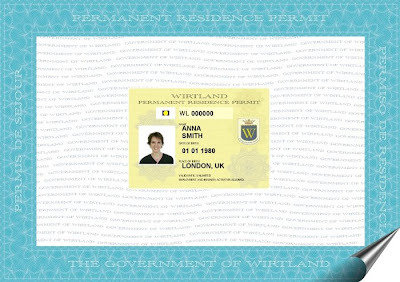 Wirtland encourages other states to treat the documents issued by Wirtland, including passports, as regular genuine documents. November 2, 2008 - Wirtland formally applied for its own country's internet top level domain (TLD) to the Internet Assigned Numbers Authority, IANA. It is the first time that a virtual country applies for its own country domain. 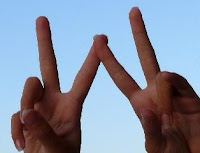 Wirtland applied for authorisation of ".wl" domain. 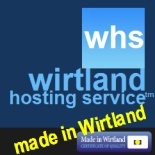 Once granted, all sites in Wirtland will have domain names that will be ending with ".wl" (such as www.Wirtland.wl). Wirtland currently uses domain www.Wirtland.com. IANA allocates and maintains unique codes and numbering systems that are used in the technical standards (“protocols”) that drive the Internet. 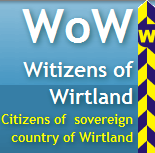 Witizens (citizens of Wirtland) who wish to communicate between themselves, now have a new tool - a social network. This network is now available at http://witizens.ning.com/. Members can post photos, video, musical content, use online chat, form groups, make their own blogs. Witizenship is not required for signing up in the network. On October 6, 2008, the first marriage was registered in Wirtland. The ceremony was conducted by means of a Skype video conference. The newly weds received a printed Marriage Certificate of Wirtland # 001, and a special wedding gift from the Government - free airline tickets. The newly weds' real location is Spain and Ukraine. The couple chose not to disclose their names for this press release. They had initially met online, and have already met twice in real life. They are both residents of Wirtland, and have recently applied for Wirtland's citizenship (a.k.a. witizenship). More information on this romantic story will follow soon. A friend of mine often tells me about that special feeling she gets when traveling abroad. She enjoys being a foreigner. She enjoys her relaxed tourist’s outfits. She likes being different from the busy crowd, when she gazes around or asks directions. According to her, you don’t necessarily need to buy an airplane ticket to enjoy this. Just put on your shorts, get a backpack and a big photo camera – and treat yourself for a day-off. We did this a couple times, even pretending we are foreigners in our hometown. It’s a lot of fun. You have the right to ask questions to everybody, to behave silly, to ignore local rules, you may even refuse to understand the local language if you want. Well, what can you do? You’re a foreigner, after all! The only problem is your ID. But not any more. 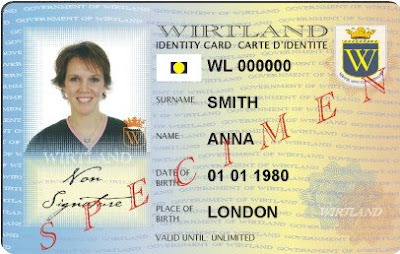 With an identity card from Wirtland you become a legal foreign visitor in any country, including your own. It is not a fake document, since there is no incorrect information in it. It bears your real name, and certifies that you are resident of Wirtland. There is nothing wrong about it. Wirtland may be not (yet) recognized by some countries, but this is not your problem. The name “Wirtland” may be just as unfamiliar to a local authority as any other small and faraway country’s name. Wirtland’s ID card will make people scratch the backs of their heads, but it won’t get you in trouble. So, what are you waiting for? Register for a free residence permit at Wirtland’s website, email your photo and claim for your ID card. And a second ID is always helpful in many situations. Though a postage stamp is not especially necessary in a virtual land, it is a traditional attribute of any country. And we could not resist this beautiful design of the first Wirtland's postage stamp proposed by Descartes, who says the cranes and other migrant birds are a universal symbol of freedom. Besides, it is a really unique gift for philatelists. The denomination of stamp is 10 ICU (International Currency Units, linked to gold price). The crane featured on the first stamp is red-crowned crane or Japanese crane (Grus japonesis). Wirtland is a cybercountry and not a member of World Post Union, so our stamps are so-called Cinderella stamps. Such stamps cannot be used as postage and are only for collectors. Wirtland stamps are hand-painted by professional artist in watercolor. As they are hand-made, the price is rather high. The price of 10 ICU stamp is same as 10 ICU gold coin. The series of postage stamps will be continued. Now you can also order the special edition Wirtland Postage Mug. 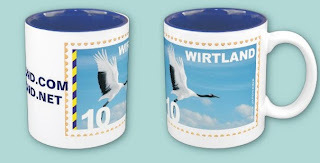 This collector's mug features the classic Crane stamp image, and was released to commemorate the second anniversary of Wirtland on August 14, 2010. On August 20 Wirtland introduced its flag. The flag was drafted by Anonimo Veneziano, resident of Wirtland. The flag consists of yellow circle on the dark blue rectangle, over a white background. The blue rectangle symbolizes a computer screen - entrance to virtual world. The yellow circle symb olizes there is no sundown in Wirtland. Some critics say the blue rectangle resembles of “Black Square”, a picture by Kazimir Malevich. We don’t mind this interpretation at all. 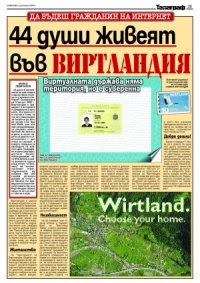 Wirtland ['v¡rtlənd] is the first virtual country (www.wirtland.com). "While the boundaries of sovereign states are becoming symbolic in Europe, in other world's regions sovereignty is being increasingly challenged, and separatism sometimes leads to bloodshed and terrorism. While these trends are contrasting, they both suggest for a serious rethinking of the notion of self-identification in a changing world. However, there are few options left for an individual, if he is not taking an active part in political life. We believe people should be offered a broader choice. Wirtland is the newest alternative for people's self-identification. Most importantly, Wirtland is a democratic, friendly, and peaceful alternative. How influential is Wirtland and when Wirtland will become a real country? It completely depends on the Wirtlanders and their will to contribute to development of this country(just like in any other democratic community). Our aim is to offer an appropriate structure, a working mechanism - hopefully an attractive one - to allow for free discussions and all kinds of activities of our citizens and other interested people. Who can apply for becoming a Wirtlander? Everyone".